A small town of Kanjiza on the Serbian-Hungarian border is full of refugees. 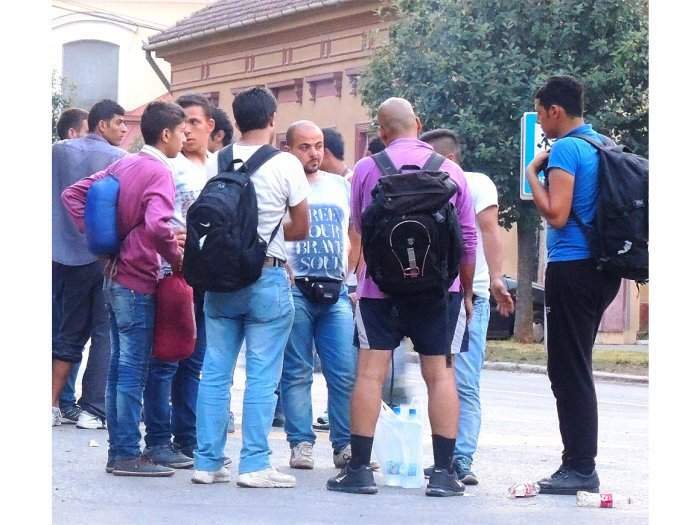 Cafe ‘Venecija’ opened at 9 o’clock in the morning, where refugees can charge their new iPhones and laptops, go to the toilet or wash their hair in the sink. In the evening in the center of Kanjiza there is no room. Hundreds of people are settled on two central squares, maybe 2 or 3 thousand people. When the night falls, the dark is the signal to move. Groups of refugees of about 30-50 people prepare to illegally cross Hungarian border. Kanjiza residents watch black shadows of immigrants in silence. ‘They come out of the city, and then they are picked by Roma mafia,” said a taxi driver Viktor. “We must not offer drive to illegals, but Roma people do what they want to. They are the main smugglers of the refugees all over the Balkan route. Roma bring refugees almost to the border, then they take them through paths in forests known only to them to Hungary. It all began in January. People began to arrive organized every day. And the flow increases. Honestly, we are scared, what will happen to us?,’ said Viktor. Europe exploded in 2015. A new route was added to two previous immigrant routes, one over Gibraltar to Spain, and the other across the Mediterranean to Italy’s Lampedusa. The safe, Balkan route. First, Turkey’s Izmir and then the Greek islands. The first “victim” was the known island of Lesbos. Greeks told me that Turks help immigrants in every possible way. It is said that Turkey deliberately sponsors refugees and literally pushes them towards international waters. Then Athens, Macedonia, Serbia, Hungary, then Austria, Germany and the Czech Republic or Slovakia. Even England has discovered that its status of the island cannot save it from the invasion. The Channel Tunnel is full of embittered refugees every day. In Germany the government had to use the army, which gave tents for immigrants and protected them from angry residents. 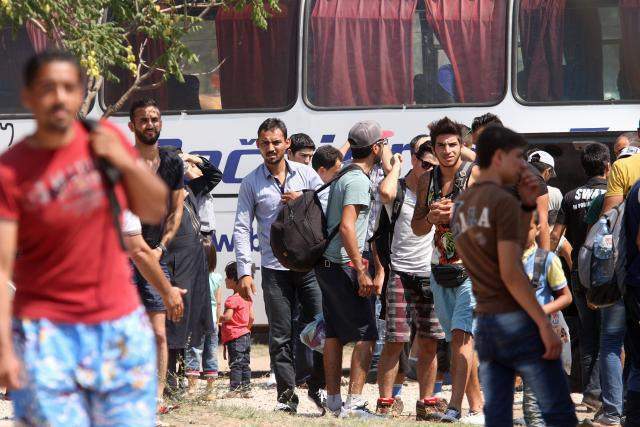 From January to July, only the Balkan route was passed by hundreds of thousands of people, and it is predicted that by the end of the year there will be 250 thousand. Next year also promises disaster. I have worked many times in “hot spots” and saw a large number of refugees in my life, lucky when they receive a piece of bread. But, these refugees impress me with their well-being and ability to quickly create their own rules. A park in Belgrade, near the bus station, looks like parks in many European cities. Men wash themselves in fountain, whole families sleep on the grass. As soon as I arrived to the park, I was warned by a group of young men. “You cannot use camera here,” said one of them in decent English, pointing at my camera. “Three days,” he said confused. “And you set your rules? This is not your country,” I told him. Then we both reduced the tone and concluded a truce. My new friend is named Halid, he is from Damascus and is 21 years old. “I am a Syrian,” he says proudly. “Not all of these people are Syrians,” he scornfully pointed at surrounding people. “And why is that important?,” I was surprised. Halid and his friends fled from Syria so they would not be drafted into the army. “Why would I fight for [Bashar al-]Assad? I would rather go to Germany,” he said. “Why don’t you seek asylum in Greece, Macedonia, or at least here in Serbia?” I asked. 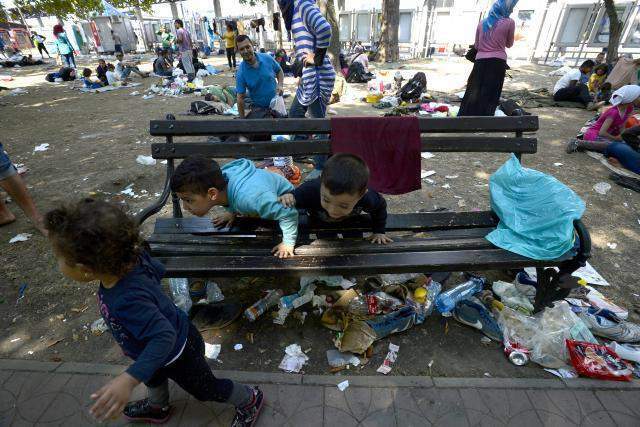 Refugees in Belgrade are not the same as Syrian refugees, whom I have seen in Lebanon, those who have lost everything and who are slowly dying under the brutal sun in crowded camps, about which nobody cares. Those who managed to reach Europe are elite. With money and goal. The police admits that there are extremists among immigrants. But, all the police can do is to take fingerprints. They say that there are probably “sleeper extremists”, who will “wake up” when the time comes and Europe will be flooded by the wave of terror. I met Dr. Ahmed in Kanjiza in the cafe ‘Venecija’. I immediately paid attention to this son of Africa with dark shining face, thick, protruding lips, and hands of a surgeon, I suppose. He slowly drank coffee and smoked a cigarette. I introduced myself and began the conversation. We spoke about what is “modern” and what is not in a war, and the fact that all refugees convinced local authorities that they come from Syria. “Trends. War!” Dr. Ahmed sarcastically laughed. “So you are right. Europe does not want to hear about the refugees from Iraq and Afghanistan. In their case they are ready to cover their ears with cotton wool. And it is even offensive to talk about refugees from Libya. France and the UK bombed my country, and they turn their heads from us. They say: here, we brought you democracy, and you did not know how to use the fruits of freedom! Actually, you Libyans should be ashamed that you betrayed our expectations. I regret, and I am a fool. We were in euphoria when they ousted [Muammar] Gaddafi. My son was a boy, he was delighted with revolution, and was killed at the end,’ said Ahmed. His face remained calm even when he spoke about his son. This is the fatalism and restraint of the inhabitants of the Muslim East. “I have two daughters. We escaped to Egypt as soon as the chaos began, leaving the tomb of my son. I am a doctor, but in Egypt I could not find a job at my level. There is competition everywhere. I hope I can validate my diploma in Europe. I speak English well. Maybe I will be lucky,” said Dr. Ahmed. “I have no objections to the Serbs. For now. But Greece, Hungary, Slovakia and Croatia are members of NATO. It is true that they did not bomb my country, but don’t they pay the money to the military budget of NATO? Don’t they send their soldiers to Afghanistan and Iraq? They will not be able to avoid punishment. NATO bathed the whole Middle East in blood, and now the weak Europe, which ceded to American Satan, will be destroyed. Our women will have many children. In five years the face of Europe will change completely. I am not looking forward to it. I respect the great European culture and I do not want to see minarets instead of churches here. But it will be so. This is revenge. Inshallah!” said Ahmed. “The attack against Libya was barbarism, whose symbol is the monstrous killing of Gaddafi. We now have a large territory with uncontrolled banditry. The war in Libya exposed the face of the West – selfish and neocolonial. We saw that France suffers from an inferiority complex, long-lost reputation and Sarkozy is playing Napoleon. We saw the UK, which has a huge historical colonial experience, but lacks military force. So the Brits often act as instigators of the conflict, trying to combine the ambitions of the former empire with American power and authority,” Jovanovic said.